With a one-day mostly sunny weather window forecast for Friday, and the impending government shutdown threatening to close all national parks at midnight EDT (9pm PDT) that night for an undetermined length of time, my favorite national park seemed like a natural destination. 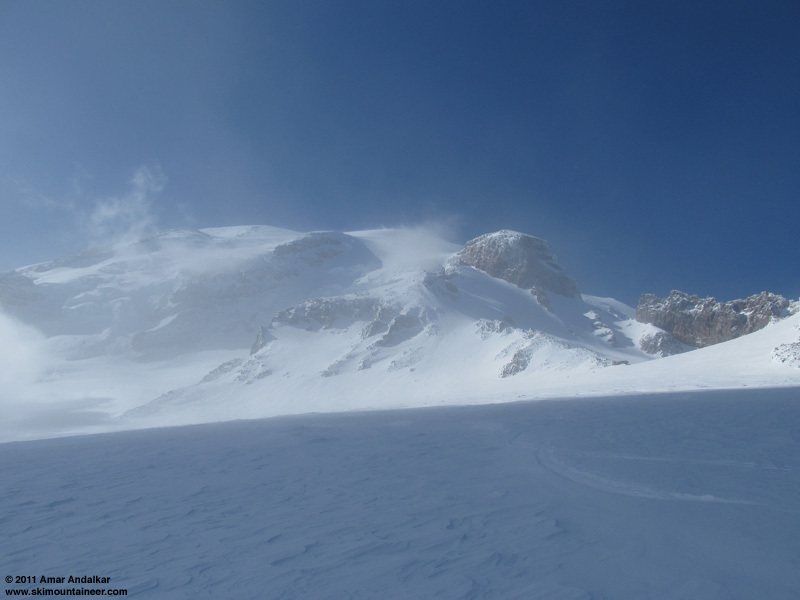 However, despite sunny weather and no new snowfall overnight, the opening of the road to Paradise was in doubt due to vague notions of high avalanche danger. We'd gotten foiled by the road just a few days ago on Sunday, when the phone recording stated an 11am-noon opening and yet the road never did open, leading us to devise a fallback plan of a short tour up through the woods from Longmire towards Eagle Peak, eventually finding some decent powder (see April 3, 2011, Eagle Peak Trail). The phone recording on Friday morning stated a 7-8am opening, but a look at the other webcam showed no cars in the parking lot even well after 8am. I called the park switchboard operator, who said that the road opening was "under evaluation" due to avalanche hazard. Ugh, maybe some other destination perhaps?? More calls later at 20-30 minute intervals gave the same story, but finally at 9:30am came relief: the road was now open. Time to leave the house at last! Skinned up from Paradise at 12:20pm in bright sunshine and calm conditions, very warm and spring-like. It's nice to have long days and late evenings, no need to rush even with an afternoon start. And no need to break trail today either, with the parking lot over half-full and plenty of trailbreakers out ahead of me. 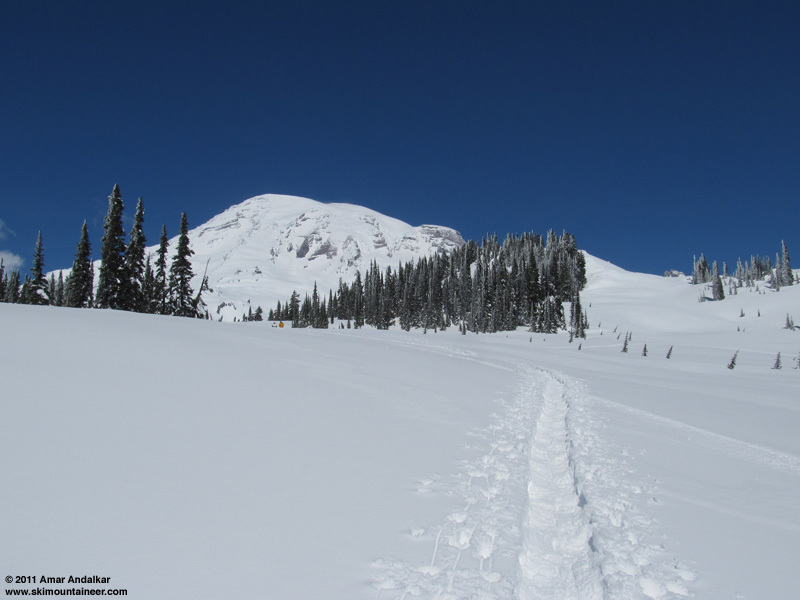 The day-old new snow beside the deep snowshoe/skin track was still only moderately sun-affected, heavy but not mushy. Looking up towards the summit, the morning's high winds and blowing snow had nearly ended. Above Pan Point, a very slight breeze picked up and temps cooled significantly, making it chilly after all the sweating thus far. And clouds were building all around, occasionally blocking the radiant warmth of the sun, sometimes slowly drifting across the Muir Snowfield and bringing fog. But each time the clouds and fog would dissipate, then build again, almost an oscillation with a roughly half-hour timescale. 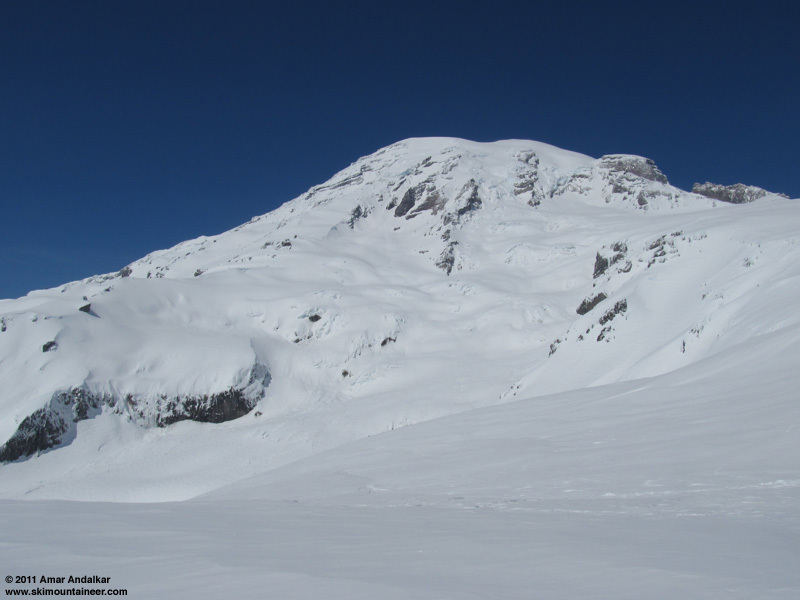 Three summit ski routes, filled in fat: Nisqually Icefall, Ice Cliff, and Gibraltar Chute. I made slow and steady progress up the skin track, passing a number of stragglers despite the 18-20 excess pounds of unwanted adipose training weight which I'm carrying this spring. A pair of South Korean skiers (now living in Bellevue) were making their first trip on AT gear and their first trip to Muir, I passed one of them at 9200 ft, chatted for awhile, and reached Muir at 4pm just minutes after the other. Congrats to them on their first Camp Muir ski! A raven cruising by at an altitude of 10000 ft. Conditions at Muir were stellar, sunny and nearly-calm with temps in the low-20s, it was great to be back up here for the first time in 2 months since my 100th ski from Muir back in February. However, more ominous clouds were building below 9000 ft, with tops rising well above the 10000 ft mark, and their darker color showed that precip was likely occurring within this new batch. I skied down around 4:30pm, on mostly smooth windpack, not bad skiing at all, minimal sastrugi and scattered icy patches which were easily avoided. But the clouds were boiling upwards toward me, and soon engulfed me as I neared 8500 ft.
Visibility dropped to 50 yards, then maybe 50 ft, and pellets of graupel were soon falling. Kept on skiing down, following the old tracks in some sections and my inner compass in others, as the snowfall increased in intensity. By 7500 ft, about 1/2" of new millimeter-size graupel had quickly accumulated, rounding and obscuring the sharp contours of the uptrack and previous ski tracks, making them hard to discern in the minimal vis. Tricky skiing and slow, but manageable, even down Pan Face. 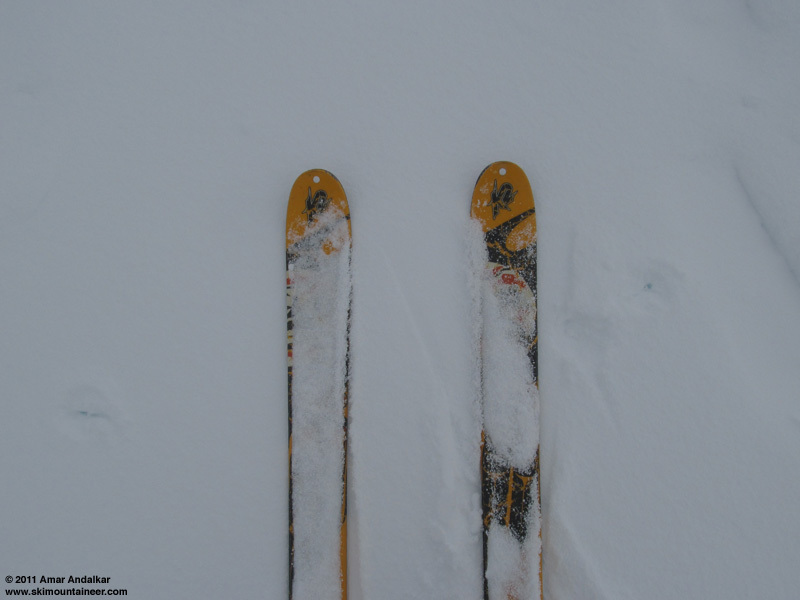 The only view during most of the descent: my skis and fresh graupel. Eventually I popped out below the cloud deck around 6000 ft, back into the bright sunshine of late afternoon slanting in from the southwest. A quick schuss of a few minutes to the parking lot finished off the hour-plus descent, most of that time elapsing within the cloud deck. Very nice to get in a quick trip up to high elevations, without getting shutdown by wind or cloud. Doubly nice to arrive home around 8:30pm, and find that the looming government shutdown had been averted with one hour to spare! My favorite national park would remain open, ready to welcome me for another trip very soon. 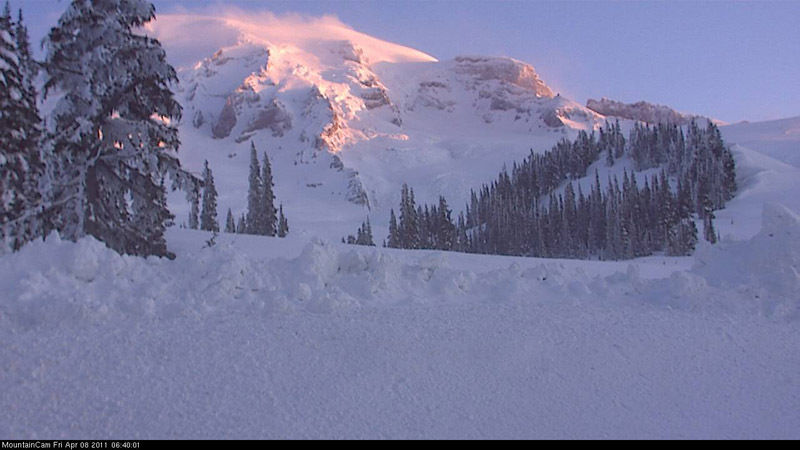 Evening glow on the west side of Mount Rainier. SYNOPSIS...AN UPPER LEVEL RIDGE WILL MOVE OVER WESTERN WASHINGTON TODAY BRINGING MOSTLY SUNNY SKIES AND AFTERNOON TEMPERATURES NEAR NORMAL. A WEAK FRONT WILL BRING INCREASING CLOUDS TONIGHT AND A CHANCE OF LIGHT RAIN ON SATURDAY. A WARM FRONT WILL BRING RAIN TO THE AREA SATURDAY NIGHT AND EARLY SUNDAY...FOLLOWED BY A COLD FRONT SUNDAY NIGHT. MOIST WESTERLY FLOW ALOFT WILL MAINTAIN A GENERALLY WET WEATHER PATTERN NEXT WEEK. FRIDAY...MOSTLY SUNNY. FREEZING LEVEL 4500 FEET. FRIDAY NIGHT...PARTLY CLOUDY IN THE EVENING THEN BECOMING MOSTLY CLOUDY. FREEZING LEVEL 5500 FEET. SATURDAY...MOSTLY CLOUDY. A CHANCE OF SNOW AND RAIN. SNOW LEVEL 3500 FEET. SATURDAY NIGHT...SNOW AND RAIN LIKELY IN THE EVENING...THEN SNOW AND RAIN AFTER MIDNIGHT. SNOW LEVEL 3000 FEET. SUNDAY...SNOW AND RAIN. SNOW LEVEL 3500 FEET. SUNDAY NIGHT...SNOW AND RAIN. SNOW LEVEL 5000 FEET. MONDAY AND MONDAY NIGHT...SHOWERS LIKELY. SNOW LEVEL 2000 FEET. TUESDAY AND TUESDAY NIGHT...SHOWERS LIKELY. SNOW LEVEL 2500 FEET. WEDNESDAY NIGHT AND THURSDAY...SHOWERS LIKELY. SNOW LEVEL 3000 FEET. 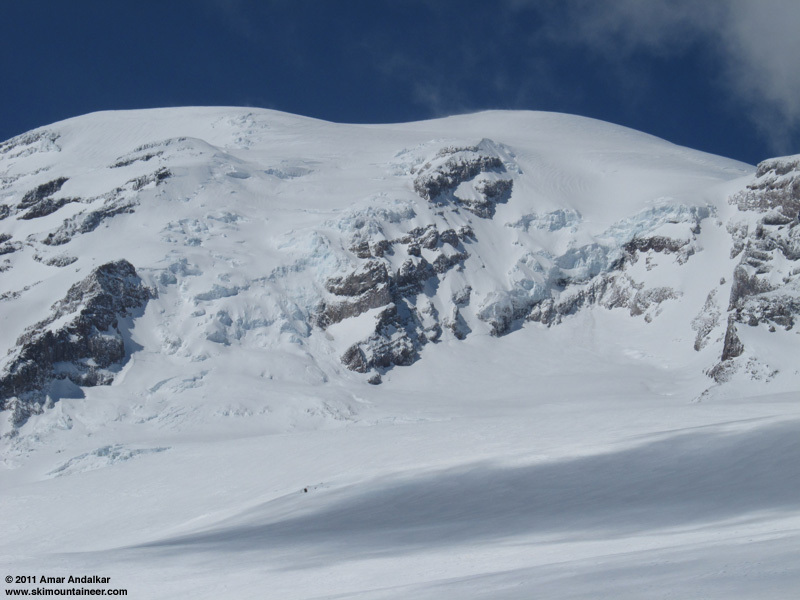 Re: April 8, 2011, Mt Rainier, Muir, Almost Shutdown? 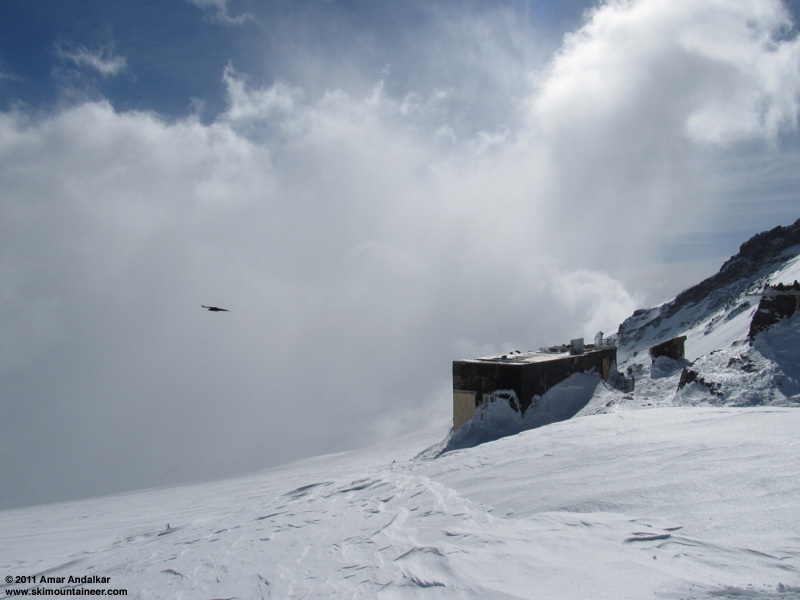 It was nice to run into you again.� I was in the group of two around 8500 on your descent... we were heading to Muir for a summit push if the weather held.� Of course, we woke up to it blowing and snowing... which you (I think) predicted. Anyway, glad to see you still taking beautiful photos. 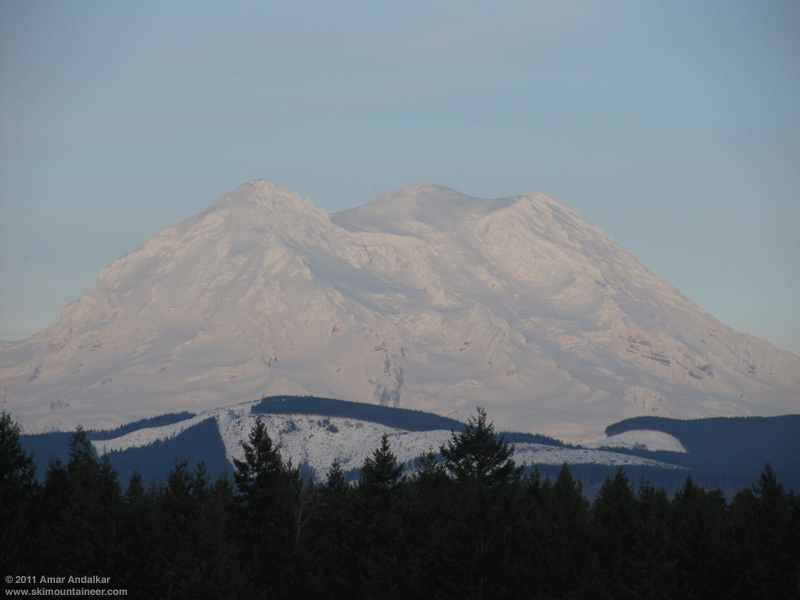 Great to see the mountain covered with so much snow. The glacierrs must be happy. Predictions on when we might see the Nisqaully will reach the bridge?